My name is Matt . live in Illinois. 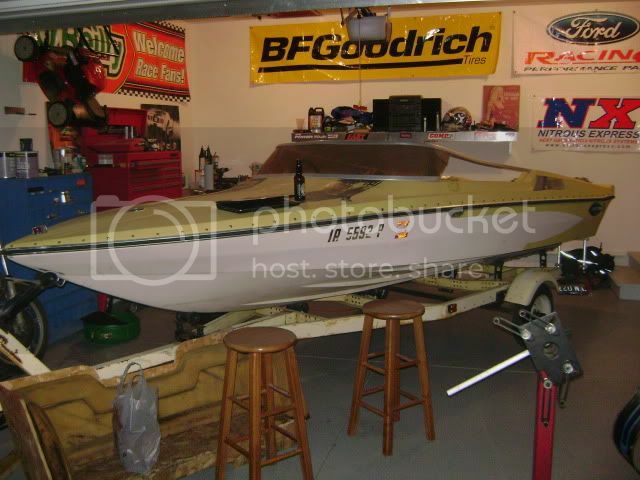 Current boat is a 15' Arrowglass tri hull...runabout / bowrider...i use FB website. I really wanted a Glastron but couldn't find that right one. Watch for Gregg's post (hypreacme) in the classified section, something will come up. My brother has a cabin in Chetek ..... might get over to visit this summer. Never know who a person will bump into! Hmm...there was a GT-150 around Des Moines that was for sale very recently...let me check again. This one doesn't have a trailer, but looks like a good foundation to start with...also a GT-160 & also $250..
Are you looking for a GT-150 or GT-160 ? I saw those 160's too and have had the nutty idea of getting another boat and probably something like that. 150's are a little smaller then what I want. Both of those in Iowa? I dont think I've seen the yellow one lately. Thought it was sold? Yes you can find a GT reasonably priced. Depends on how much work you want to do. Yep, both are in Iowa...the ad on the yellow in is still active...guess it could be sold, I wasn't following that build as closely as I could have been. will be floating around week of the 9th if everything stays the way it is right now. Matt - If you find something in the twin cities(Mpls./St. Paul) area that you might be interested in don't be afraid to start a post and ask if someone locally can go take a look at it for you. 1984 CVX-17 140 Johnson (GPS) 53mph-Viper 19p prop. Hello Matt.. I'm also a newbie.. I run across this site and thought it would be a good source to sell my GT150.. I posted what I have,and the story behind it...If interested, let me know. Hi Gordon & Welcome to the CGOAMN forum ! Have you posted it on the CGOA "For Sale" section ? Well, you joined the forums! Application Done. Welcome! We'd love to see photos! Welcome to the CGOAMN forum Bob ! By joining forum your a member.